Another question for you. How valuable do you think segmentation is for omnichannel retailers? Should every retailer do this type of analysis before deciding whether it should engage in same-day fulfillment and delivery? Thanks for the note. Great question. Profit-based segmentation is absolutely critical for retailers, both for traditional business, and for omnichannel and possibly same-day deliveries. In virtually all companies, the majority of transactions and customers are largely unprofitable, while the minority are highly profitable. Most of the cost and inefficiency comes from the unprofitable portion (which I call the Minnows and Coral Reefs). Why give unprofitable customers enhanced services that make them much more unprofitable – and remove resources that should be spent on making the Islands of Profit customers even better served? Major changes are sweeping through retailing and distribution, upsetting traditional ways of operating. These changes bring huge new risks and enormous new opportunities. If managed well, a company can leapfrog its competitors, carving out a leading position for years to come. But if not managed thoughtfully, they can cause costs to explode, service to drag, and market position to falter in a surprisingly short period. What are the key elements of success? Over the past several months, I have worked with a major retailer that is a leader in its segment. This highly-successful company increased its already-strong profits by nearly 300% using profit-based segmentation in combination with a range of powerful enhanced services including omnichannel retailing and same-day deliveries. The core to understanding how to craft a powerful, multi-dimensional, enhanced service strategy is profit-based segmentation, which is rooted in profit mapping. I’ve written about profit mapping in my book, Islands of Profit in a Sea of Red Ink, and in many of my blog posts. The underlying methodology is to create a full P&L on every transaction, or invoice line. You can aggregate these in a database, and unravel a company’s complex profitability picture along any dimension – customers, products, vendors, segments, sales reps, and others. For example, we have developed a very powerful, sophisticated system that does big data profit analytics, including profit mapping; for more, please see: www.profitisle.com . Profit maps are critical to developing and deploying new enhanced services like omnichannel retailing and same-day deliveries. They tell you where you are making money, and therefore where you can and should invest in enhancing customer service because you will get much more in return. They also tell you where you are losing money, and thus what parts of your business will become even more unprofitable if you continue to layer on more and more enhanced services. This is a very typical picture of a successful company’s profit landscape. Islands of Profit. Only 9% of the customers are Islands of Profit – the company’s high-revenue, high-profit sweet spot – yet they bring in 47% of the revenues and a whopping 142% of the reported profits. Your prime business objective is to secure and grow this segment of your business by building loyalty and providing terrific value, while attracting more customers who fit the profile. You should provide a full range of enhanced services to this segment because the payoff is very high, because it builds very strong competitive advantage, and because these services will enhance this key group’s loyalty. Coral Reefs. On the other hand, Coral Reef customers – high-revenues but low-profit – represent 26% of the customers and 30% of the revenues – but only 6% of the reported profits. These customers are large, but marginal or unprofitable. They don’t warrant provision of enhanced services unless you have a very well-managed program to convert them to Islands of Profit. 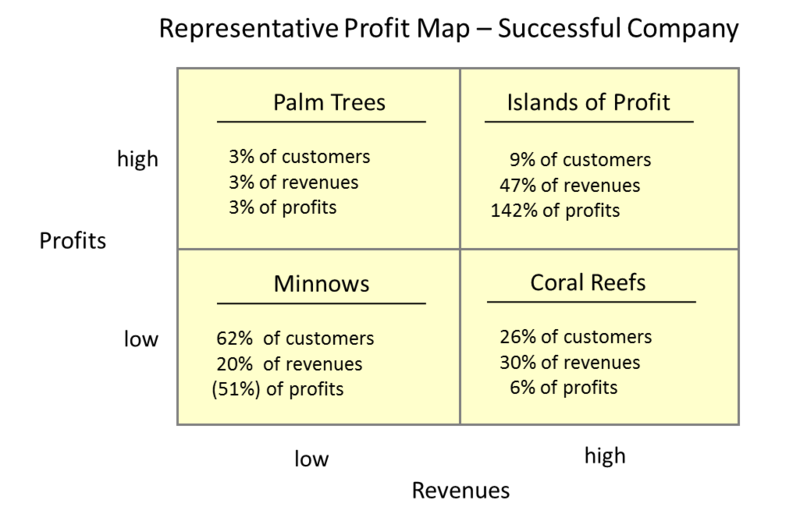 Note that most marketing analyses would treat both the Islands of Profit customers and the Coral Reef customers as the same because they focus on revenues, not profits. In fact, nearly all marketing analysts do not have the sophisticated analytics necessary to sort this out. In fact, because there are over three times as many Coral Reef customers as Islands of Profit customers, most services aimed at this combined group will be dissipated on unprofitable and marginal customers. Minnows. These customers – low revenues and low profits – account for the majority of the company’s customer base, and 20% of the revenues – yet they actually eat away 50% of the profits made from other, primarily Islands of Profit, customers. Minnow customers are small and unprofitable, yet in most companies they account for a majority of the business activity and a disproportionate amount of the costs. Simply offering enhanced services to all customers will mostly benefit the Minnow customers, with little return and wasted resources. Offering enhanced services only on larger purchases is similarly flawed because the purchase may well be unprofitable, and because an Island of Profit customer with an occasional small purchase surely warrants enhanced service in light of the overall relationship. Your objective for this group is to minimize your cost exposure, unless you can convert them to Islands of Profit customers. For the most part, providing Minnow customers with enhanced services merely throws a lot of good money after bad. It might be argued that some Coral Reef and Minnow customers might be enticed to become Islands of Profit, and thus should receive enhanced services like same-day deliveries. Often, this becomes a strong marketing argument. The right way to handle this situation is to offer the service on a trial basis, and to monitor carefully whether the customer’s purchase pattern changes and the customer actually becomes an Island of Profit. Palm Trees. This company has only a few Palm Tree customers – low revenue but high-profit – with 3% of the customers generating 3% of the revenues and 3% of the profits. This is a small group, but important to the company’s prospects for future profitable growth. In this way, profit-based segmentation enables a company to offer a powerful range of enhanced services, gathering huge benefits from its high-profit customers, while keeping its costs under control. What does this mean for the development and deployment of new enhanced customer services like omnichannel retailing and same-day deliveries? It makes all the difference between success and failure. Most companies simply assume that these enhanced services are new capabilities that they should offer to all their customers. This is a huge mistake, and it is rooted in a fundamental misunderstanding of customer service. Customer service is correctly measured by how often you keep your promise to your customers. But you do not have to make the same promise to all customers. Here’s the dilemma: if you try to give the same fast or enhanced services to all your customers, your costs will explode – or your service will degrade across the board, unless you pour inordinate amounts of resources into customer service. Better to define different levels of order cycle time or enhanced services for different groups of customers, with your Islands of Profit customers receiving the highest level of service, but with all customers consistently getting what they were promised. This way, you will be able to keep your service promises to all customers at a reasonable cost. For more on this, see my blog post on service differentiation, The Dilemma of Customer Service. Thus, service differentiation is the key to linking profit-based segmentation to provision of enhanced services like omnichannel retailing and same-day deliveries. For example, think about omnichannel retailing, which many companies are considering in response to moves by Amazon and others. Omnichannel retailing is a very powerful marketing approach that is now emerging. Many companies see this as necessary to stay competitive. Yet, it can be enormously expensive and unproductive if not constructed in a thoughtful way. Profit-based segmentation is the key to getting it right. Let’s return to the profit map. The omnichannel issue is analogous to the same-day deliveries issue, in a very fundamental sense. The question is whether a company simply assumes that its omnichannel resources (and same-day deliveries) should be spread across all customers and potential customers, or whether they should be concentrated where they provide the highest returns – the Islands of Profit customers. Certainly, all-purpose websites are open to all potential and actual customers. However, really effective omnichannel retailing entails much more than that – enhanced services ranging from recognizing who is coming onto the website, to offering select customers custom views and online chat, to following up by email and phone, to enabling the customer to receive expedited shipping or priority on local store inventory. The decision of how much to invest in enhanced services like omnichannel retailing and same-day deliveries should and must be determined by profit-based segmentation: it is not a question of whether to offer these services, but rather to whom to offer them. And, if the answer is effectively everyone, your best customers will wind up getting very thin gruel indeed. As we saw before, Islands of Profit customers warrant the enhanced services that characterize really effective omnichannel retailing because they will generate ample profits that defray the cost and provide a strong return. If an Island of Profit customer occasionally consumes services but only has a small purchase, the overall value of the relationship still warrants great service. On the other hand, in the absence of profit-based segmentation, companies most often fall back on simple segmentation based on overall customer revenues or order size. Both of these segmentation measures are fundamentally flawed, and will create major profit drains that result in the inability to build great services aimed at those who really count. Offering full omnichannel service, and similarly offering same-day deliveries service, to all customers simply dissipates resources faster, and leads to even less for the Islands of Profit customers who generate the company’s core profitability. The worst case scenario is that a company offers omnichannel services, same-day deliveries, and other costly enhanced services to all customers, quickly runs short of resources, and winds up with a meager, uncompetitive offering. The biggest danger here is that if a smarter competitor develops a service differentiation strategy rooted in profit-based segmentation, and offers really state-of-the-art services to its Islands of Profit customers – with satisfactory services to its other customers – the competitor will pick off the best Islands of Profit customers from the other firms in the business. This will leave the other firms with only the marginal and losing portions of their businesses. The smarter company that rooted its strategy in profit-based segmentation will leapfrog into a leading position, while the less thoughtful companies will see their key sources of profitability dwindle away. The lesson? The key to success in this new competitive world is to shape and focus your strategy using profit-based segmentation. You will sprint to an early competitive lead, and harvest the enormous first-mover advantages for years to come.